The blowhole of a North Atlantic right whale is seen from the research vessel Shearwater's upper deck off shore from Provincetown, Mass., in Cape Cod Bay. Sound-seeking gliders will cruise the habitats of North Atlantic right whales in a bid to capture their calls and learn more about how noises in the ocean may affect the health of the endangered species. 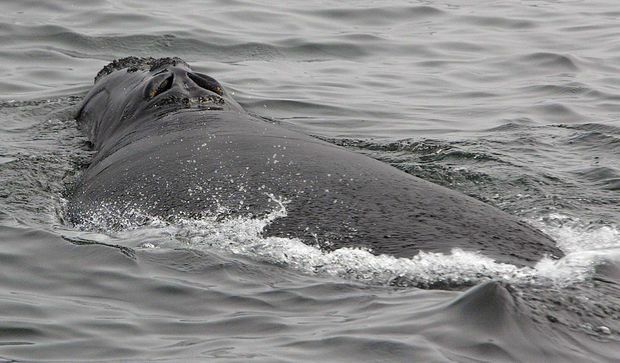 “It’s really important to do the research, because if you don’t know where the right whales are, you can’t protect them,” Andrew Wright, a marine biologist at the Bedford Institute of Oceanography, said at the announcement in Halifax. Darren Fisher, a Halifax-area MP, made the announcement at Halifax’s Bedford Institute of Oceanography, where much of the research will be carried out. “Establishing baseline data of environmental noise is important in understanding and quantifying noise levels that human activities are contributing to our oceans,” said Fisher. Clair Evers, a marine mammal biologist with the Fisheries Department, played recordings of whales with one sound — referred to as an up call — reminiscent of a plaintive horn, while another sounded like a gun firing.